Mediterranea, the beautiful Gulf view South Walton vacation rentals on Miramar Beach, welcomes you to book your trip of a lifetime. Let your cares vanish as you relax on your balcony overlooking 6.8 acres of tropical landscaping and the beach beyond. The incredible views of the emerald waters of the Gulf of Mexico can be seen from each vacation rental at Mediterranea. Here, you will enjoy beautifully appointed, spacious interiors all with whirlpool tub in the master bath, and wonderful community amenities such as large pool and hot tub, tennis court, fitness facility, wireless internet and more. Mediterranea is ideally located on Scenic Gulf Drive close to popular local restaurants such as Pompano Joe’s and within a short drive to some of the area’s best shopping at Silver Sands Outlets. In fact, everything in beautiful Destin is only minutes away, and you can learn all about local attractions and restaurants via Southern’s Gulf Coast Guide. Bring your family or friends and treat yourself to Mediterranea! Choose Mediterranea #204B for your next beach retreat in Destin, Florida and enjoy staying just across the street from the beaches of the Gulf of Mexico. Create sweet Southern moments along the stunning shoreline of Destin, Florida when you choose to stay in Mediterranea #213E during your next beach retreat. It is finally your time to escape to the beach, with a stay at Mediterranea 403A that is! 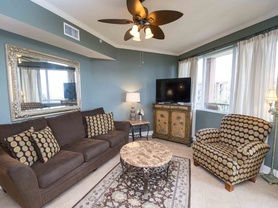 Appreciate a spacious layout and gorgeous Gulf views in this two bedroom, Destin condo rental. Enjoy a wonderful trip to the beach as you stay with us at Mediterranea #411D in the Miramar Beach community of Destin. Indulge yourself with three different balconies offering gorgeous views of the Gulf of Mexico and surrounding area from our two bedroom Destin vacation rental.